bar, steel rod) cutting.widely used in construction engineering.Our products are light, small, quiet portable and easily to operate. Also it safe for the users, as cutting without sparks and sediment.The products have CE certificate. 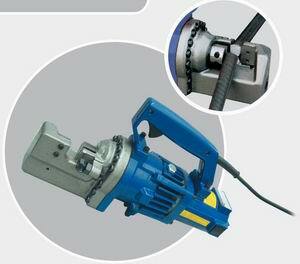 We can provide Okey brand Rebar Cutter. Our rebar cutters have an ninety percent market share in USA, Europe. our products approved by CE, RoHS.It has an excellent capability with the strong hydraulic system of precisive process and is durable. -In stead of adopting the gasket system between head and pump, applying to high-tech processed O-ring system can solve the problem of oil leakage between the two parts. -using stable motor that benefit for offer powerful cutting power, working more efficency as cutting without sparks and sediment, also low noisy.products are light weight, small, quiet portable and easily to operate. RC-16 for cutting 4-16mm rebar, others as follow, RC-16B ( 4-16mm ), RC-20 (4-20mm ), NRC-20 (4-20mm), RC-22 (4-22mm), RC-25 ( 4-25mm).